Hollywood prefers its restaurants hidden, expensive, and highly exclusive. And who can blame the famous wanting simply to eat their food without distraction? But for every $150 pre-fixe menu and darkly lit sushi joint, there’s always an exception. And Canter’s Deli on Fairfax might be Hollywood’s biggest exception of them all. 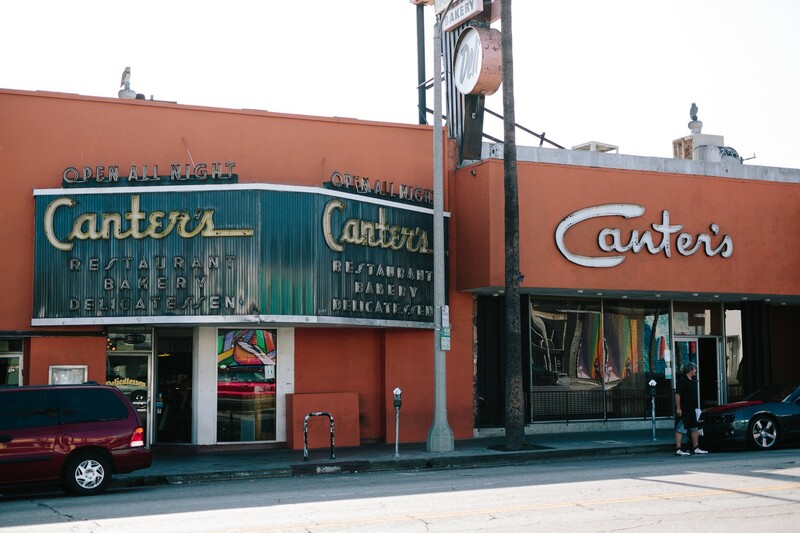 Opened originally in Boyle Heights, Canter’s landed in its current Fairfax Avenue location in the late 40’s and immediately engrained itself in Hollywood’s shitshow folklore. Open 24 hours and due south of the Sunset Strip, Canter’s became the go-to spot for movie stars, rock musicians and the counterculture flag-wavers. And in 2015? We’re happy to report its all pretty much the same. First off, Canter’s is flat-out enormous. With a bakery, two dining halls, and a separate bar, Canter’s feels like the first floor hotel lobby where all of LA is staying. Don’t be alarmed to see your hometown girlfriend (who doesn’t even live in LA), Adrien Brody, and your blacked out landlord all sitting in the same row of booths. Stressed? Don’t be. It’s all part of the fun. Aside from the fact Canter’s is still one of the finest Jewish deli’s in the country. Known for everything from corned beef to bagels, their massive menu is chock-full of old school standbys. Though you can find anything you want to eat here, we highly recommend staying amongst the Canter’s classics. The matzo ball soup, Canter’s Fairfax, potato salad, or Corned Beef Reuben are always delicious and the perfect way to end a marathon night of drinking. Canter’s is a true LA original and walking through its old kitschy doors feels like you’re walking into the heart of our city. So much has happened inside these crazy confines and so much is still to come. Time to get in on the action. This classic sandwich is the perfect remedy when your drunk self can’t decide between their corned beef or pastrami. It’s a tough choice. But with the Fairfax, you get both! And this mile-high stack of first rate meat is as good as you’ll ever have. One of the other Canter standards, this glorious sandwich with sauerkraut and house-made Russian dressing is East Coast realness in the heart of Los Angeles. Canter’s bakery is excellent and their bagels are a premiere addition to an otherwise West Coast wasteland of them. With the Little New York, you get that bagel and fresh lox, crammed together in this classic. You might not always think of turkey at the Jewish deli, but Canter’s is bringing it right to ya in this big, sloppy, cole-slaw filled mess of a sandwich. Canter’s version of this American classic is one of the better ones in town. Possibly not the safest bet at 3am with a vodka-filled stomach though. Included as a side with most sandwich orders, this is deserving of its own separate order for the table. It’s the best in the city. Hands down. NOTHING tastes better in the middle of the night than this Jewish hangover cure. Breakfast served 24 hours is one of the better things about being alive and if that’s what you’re craving, this better be your first order of business. Fred 62 in Los Feliz might be a drunk diner favorite, but it's pretty great any time of the day.